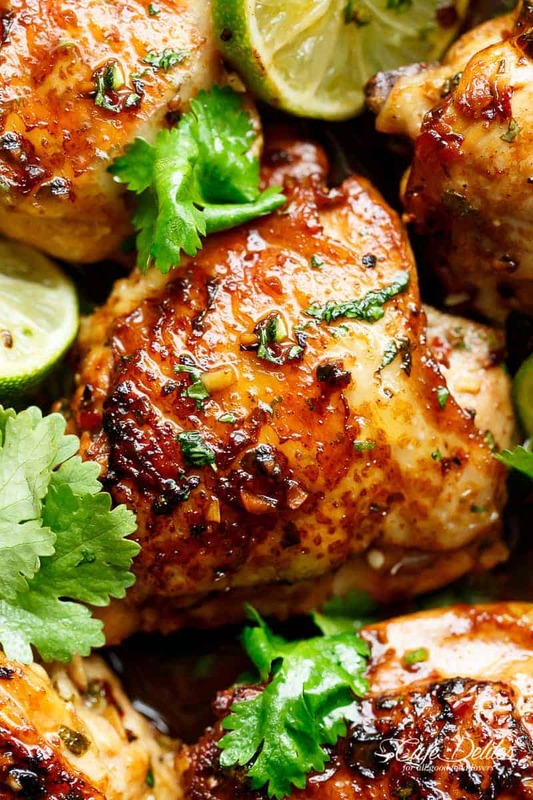 Our Crispy Cilantro Lime Chicken Recipe is full of incredible flavour! Juicy on the inside bone-in chicken thighs with a golden, crispy skin! Mexican-inspired Crispy Cilantro Lime Chicken that marinates in no time thanks to a rich-in-flavour sauce. 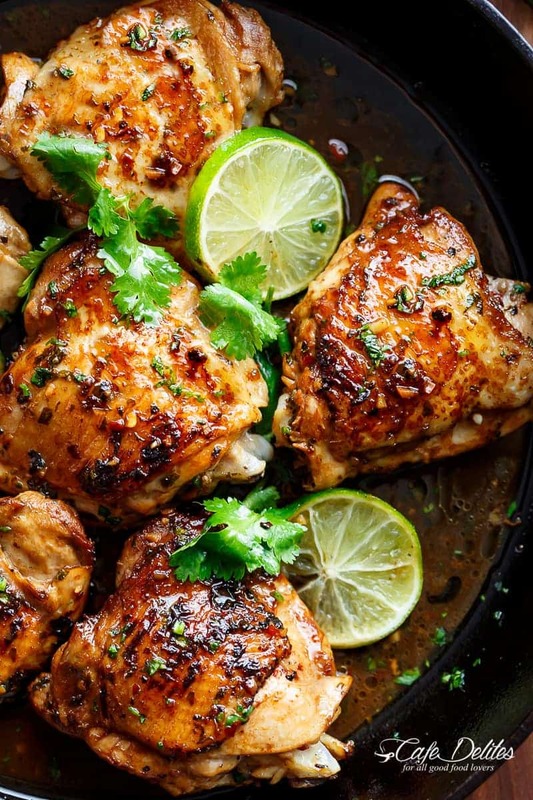 Garlic, cilantro and lime takes simple oven baked chicken thighs and turns them into a mouth-watering recipe thanks to all of those flavours mixing through the incredible pan drippings! No need to go anywhere or get take out when you can have juicy and crispy chicken on your table in no time with everyone feasting on some incredible chicken! The sauce is so good you’ll be licking your plates clean! Fresh lime — use fresh lime juice for the best flavour. Don’t go for the bottled stuff. Cilantro — substitute with fresh parsley if you don’t like cilantro. Red chili flakes — if you don’t like a bit of heat, leave it out all together. Or for more heat, add more! Brown sugar — you can also use honey if you prefer. I love brown sugar in this. It balances out the acidity of the lime juice. I used bone-in, skin on thighs in this recipe, but you can use skinless and boneless chicken breasts if you prefer. The cooking time will change slightly, depending on the size and thickness of your chicken breasts. 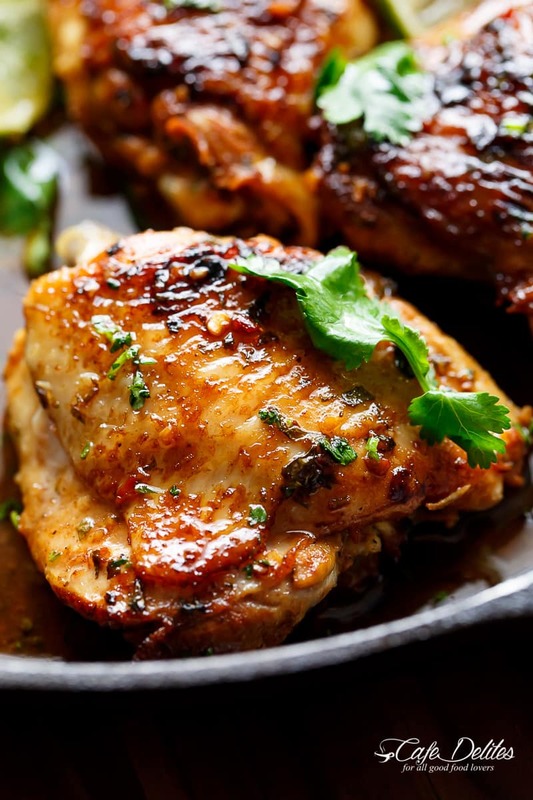 Chicken always needs to be cooked to an internal temperature of 165 degrees F.
Even though there are many Cilantro Lime recipes out there, I KNOW you guys will love and appreciate this one. Because CRISPY SKIN wins food lovers over EVERY SINGLE TIME. Crispy Cilantro Lime Chicken is juicy on the inside, golden and crisp on the outside, cooked in mouth watering flavourful pan drippings! In a medium-sized shallow bowl, whisk together 2 tablespoons olive oil together with the lime juice, chopped cilantro, chili flakes, garlic, sugar and cumin. Add the chicken thighs to the marinade and toss to evenly coat. Cover and refrigerate thighs for 15 minutes. Heat the remaining one tablespoon of oil in a non stick pan or cast iron skillet over medium-high heat. Add in the thighs along with any marinade left over in the bowl, and sear chicken — skin-side down — for 4 minutes on each side until golden and crispy (chicken will not be fully cooked). Transfer to preheated oven and bake until the chicken is cooked through (about 15-20 minutes). Garnish with fresh cilantro leaves and lime slices or wedges. Serve over steamed rice or cauliflower rice, and drizzle with the pan juices.